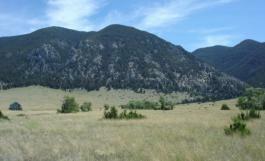 Mustang Ranches lies just east of the Airpark and offers 20 acre parcels within walking distance to the Lee Metcalf Wilderness in the Madison Range of the Beaverhead National Forest. All lots have fantastic mountain, valley and wildlife views. The Airpark is a small county airport with no commercial flights. The Home Owners dues are approx. $100 per year and covenants are minimal.